The rise of technology has improved our lives in countless ways. It has given us the ability to access tons of information within a matter of seconds, stay in touch with friends and loved ones around the world, and so much more. Technology infuses our homes, keeps our families safe, and makes many tasks a whole lot easier. There’s one big challenge, though—trying to figure out what to do with all those wires and cords. We rely on electronic devices every day. It’s easy for our homes to become overrun with cords and wires. In addition to being unsightly, having all those cables lying around can be dangerous. They’re a tripping hazard and, if they are in poor condition or hooked up improperly, they could cause fires. So, what’s a neat freak and safety-conscious homeowner to do? The good news is that there are several ways to organize common household wires and cords. Things like cell phone chargers are often bulky and don’t fit well on regular power strips. This often leads homeowners to piggyback power strips one on top of another to make room for everything that needs to be plugged in. Unfortunately, this leads to major cable disorganization and can be a fire hazard. Investing in power strips with rotating plugs makes it much easier to plug everything into the same strip. The individual outlets on the strip can be twisted to make more room for bulky adapters and chargers. These power strips are major upgrades to the old-fashioned kind. Rotating plug outlets help you cut down on the cord clutter behind your television, next to your bed, and in other areas of your house. No one enjoys looking at a spaghetti monster made of up wires and cords. By bundling them together, you can make your space look neater and tidier while preventing them from getting tangled up. With a product like the Cable Management Kit and Cord Organizer from Tokye, you can color-code all of your cords and wires, bundle them in a sleeve, and tuck your power strip into a simple and attractive box. You can also bundle cables together using zip ties, Velcro cable ties, and a wide range of products that have been specifically designed for cord management. If you don’t already have one, investing in a label maker will make your life a whole lot easier and more organized! One of these handy devices will enable you to create labels for just about everything you can think of—including all those cords. Instead of trying to remember which cord powers which device or guessing until you unplug or plug in the right one, you’ll be able to find the one you need at a glance. Just fire up your trusty label maker and get to work! Label makers are great for labeling all those cords that you’ve decided to keep “just in case” you need them later. Imagine never digging through your junk drawer and trying to guess what device a cord goes to ever again! If you’d rather not buy a label maker, you can also print your own labels using your inkjet printer or laser printer. Simply print a description for each cord or wire on a self-adhesive address label, and you’re all set! If you are like most people, you probably have a lot of cords and wires lying around that you don’t necessarily use every day but still need to keep. Think of things like spare cell phone chargers, chargers for hand tools, extra component cables for your entertainment system, spare extension cords, etc. If you leave them lying around until you are ready to use them, they are likely to get lost or damaged. They are also, of course, an eyesore. Coming up with a tidy storage solution keeps them organized and ensures that you will be able to find them when you need them. There are plenty of products out there that are designed specifically for storing cords, but there are also some great DIY solutions. One of our favorites is turning a Christmas ornament organizer into an all-in-one space for storing all those extra cords and wires. Instead of using each section for a holiday ornament, use it to store one of your cables. Using each section for one wire or cord ensures that nothing will get tangled up. You can also label each individual section so you can find exactly what you are looking for at a glance. Chances are, everything in your home isn’t located right next to an outlet, and you have cables that are somewhat spread out. Clips and cord organizers are a great way to keep everything neat. 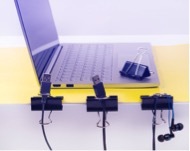 Think of all the cords running behind your desk for your computer, printer, and other peripherals. Or chords for cell phone chargers, baby monitors, lamps, etc. Cord clips come in several sizes and styles, and they’re often self-adhesive. Stick a few on the back of your desk, and you can route a cable where it needs to go while keeping it hidden out of sight. For cords and wires that run along the floor, invest in floor covers or “raceways” that are designed to protect and conceal them. For the do-it-yourselfers, clothespins, binder clips, and even pre-slit foam pipe insulation can all be used to route cables and keep them under control. We rely on electronic devices for just about everything. The things our devices can do for us are pretty amazing, but the cords and wires they require often get in the way. Fortunately, there are several ways to keep things neat and, more importantly, safe. With the tips listed above, you can organize all the wires and cords you need to power your home. Author Bio:Tania Longeau serves as the Head of Services for InkJet Superstore. Tania oversees a team of Operations and Customer Service Reps from the Los Angeles headquarters. Before joining InkJet Superstore, Tania was a team leader and supervisor working for one of the biggest mortgage and real estate companies in the country. She is a happily married mother of one who enjoys spending time with her family and reading in her leisure hours.